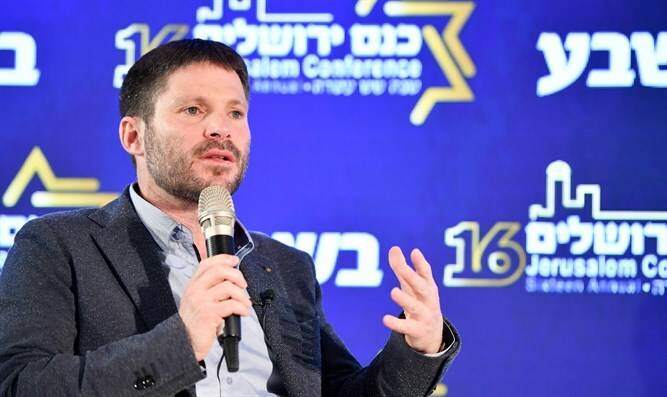 "Religious Zionism as a path is much greater than any single person, so I'm confident it'll win," said National Union Chairman Betzalel Smotrich at the Jerusalem Conference of the Basheva newspaper. "We'll go together with Jewish Home, and we'll go together with Eli Yishai; we don't have the luxury to afford losing even one vote. Unity is more important than any one of us. This isn't the time to be checking everyone's ideological purity, rather it's the time for making concessions so we can unite and run together," he said. "I don't understand what the 'national-religious mainstream' means; we're all in the same place, it's the home of us all. It's a fact that for the past few years we've been in Jewish Home and didn't run away. Religious Zionism is rich - rich in opinions and yet still everyone's home and its path greater than all," said Smotrich. In his speech he critiqued New Right Chairman Naftali Bennett: "Bennett's in distress. He started out and was sure the secular Right would fall into his arms. He felt religious Zionism was a ball-and-chain. Then apparently he felt it cold outside and no one followed him so he came here, he came home. It's hard to say 'I'm sorry' so he said he is religious Zionism - but he's not. He left religious Zionism. He later discussed Justice Minister Ayelet Shaked: "All the achievements of Ayelet Shaked in the Justice Ministry aren't 'her' achievements, but rather those of the religious Zionist party. Religious Zionism is the least segmented sector on the one hand and the most idealistic and dedicated on the other. When we take care of settlement budgets, we're taking care of those who stand at the forefront of modern Zionism. "Maybe Bennett's confusing leadership with the prime minister's seat, it could be. But can you imagine the IDF without religious Zionism? Can you imagine the State of Israel without settlement? Even Bennett, who went to a secular party, is returning home because the entire nation is returning to its roots, and in the end it'll also reach the prime minister's seat. "It's true they [Shaked and Bennett] consulted me before splitting off and I said it represented an error in values. To think that religious Zionism can't reach the leadership, can't reach the prime minister's seat, this is an error in values. It's an incorrect statement and a tactical mistake. It is a fact that until now we're still busy picking up the pieces. And with G-d's help we'll do this and soon we'll be on the starting line for elections."